If you have never made lasagne with fresh pasta, you are in for a treat; the thinness of the pasta lets the flavors of the sauce and cheese marry to create a lasagne that’s light and truly special. It cannot be duplicated with thicker store-bought noodles. Mound the flour on a clean work surface. With your hands, make a high-walled, 7- to 8-inch-diameter well in the center of the flour. Crack the eggs into the well. With a fork, lightly beat the eggs, gradually pulling flour from the inner rim of the well into the egg, until a soft, clumpy dough begins to form. When the dough becomes difficult to work with the fork, use your hands to pull in the remaining flour from the well, kneading gently until the dough is cohesive. Move the dough off to the side and, with a dough scraper, scrape up and discard any bits of dough stuck to the work surface. Clean your hands. Lightly dust the surface and your hands with flour and knead the dough, adding more flour as needed, until it becomes smooth, elastic, and just a bit tacky, about 5 minutes. Cover the dough with a clean towel and let rest at room temperature for 20 minutes. Lay a clean tablecloth or several kitchen towels on a counter. Cut the dough into 6 pieces and cover with a towel. With your hands, flatten and shape one piece of dough into a 1/2-inch-thick rectangle. Dust it lightly with flour and pass it through the widest setting on the pasta machine. If the dough comes out oddly shaped, reform into a rectangle. Fold it in thirds, like a letter, and if necessary, flatten to 1/2 inch thick. Pass it through the widest setting again with the seam of the letter perpendicular to the rollers. Repeat this folding and rolling step 10 to 12 times, dusting the dough with flour if it becomes sticky. 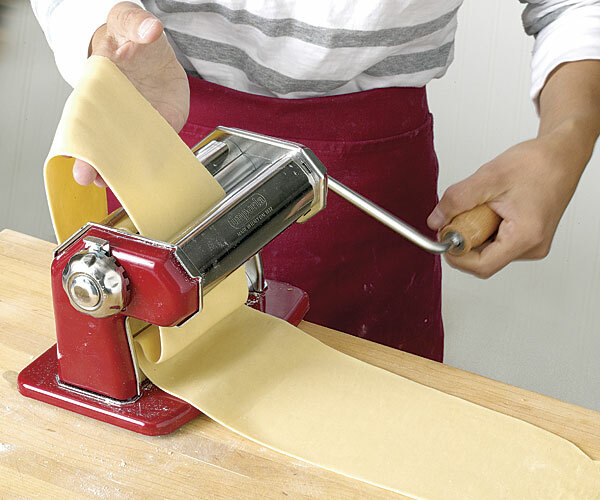 Without folding the dough, pass it through the next setting on the pasta machine. 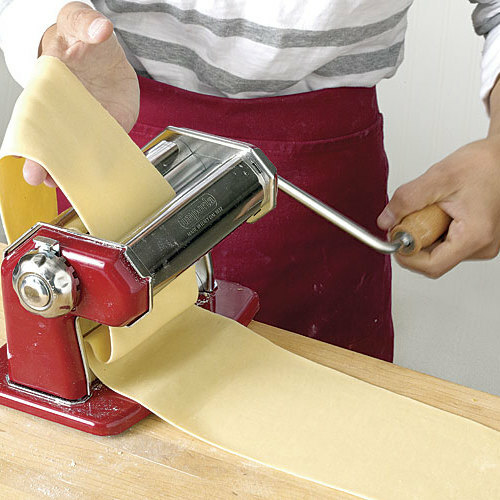 Keep reducing the space between the rollers after each pass, lightly dusting the pasta with flour on both sides each time, until the pasta is about 1/16 inch thick and 3 inches wide. Lay the rolled-out dough on the tablecloth. Roll out the remaining dough in the same manner. Cut each strip of dough into 11-inch lengths. Bring a 10-quart pot of well-salted (at least 1 Tbs. salt) water to a boil over high heat. Put a large bowl of ice water near the pot of boiling water. Line a rimmed baking sheet with two clean kitchen towels or sheets of parchment and have more towels or parchment ready. Put 3 or 4 noodles in the boiling water. Once the water returns to a boil, cook for about 30 seconds. With a large wire skimmer, carefully transfer them to the ice water to stop the cooking. Repeat with the remaining noodles. Drain the noodles and rinse under cold water. Very gently squeeze each noodle to remove excess water and then spread it flat on the towel-lined baking sheet. Layer the noodles between clean towels (or parchment) and set aside until you’re ready to assemble the lasagne. To store the pasta for up to 24 hours before assembling a lasagne, layer the cooled, cooked noodles on a baking sheet, wrap tightly with plastic, and refrigerate. It’s important to use room-temperature eggs when making fresh pasta because they’ll be more readily absorbed by the flour. Don’t layer the pasta on kitchen towels if you use a scented fabric softener because the pasta will pick up the scent—use parchment instead. Excellent, easy to follow recipe. It took me longer than I had planned, but the results were amazing. Will never buy them in the box again. The lasagna tonight tasted great! I can’t wait to eat the leftovers. Can this dough be made in my kitchen aid mixer or food processor? I have not made this yet but I needed to rate in order to submit. This pasta turned out perfect and made the lasagna wonderful! You'll never go back to the 'rubbery stuff' from the grocery store again. If I could give this lasagne 10 stars, I would. This is the best thing out of my kitchen this year. It is imperative that you make the noodles from scratch. The author's description of the lasagne is spot on. Heaven on a plate.